Jordan Klepper Solves Guns airs Sunday, June 11, 10pm on Comedy Central. Hot take: Jordan Klepper should have been named host of the Daily Show. He had the experience, comedic chops, and charisma to take the reins from Jon Stewart. Trevor Noah is doing alright, but I’ve still been rooting for Klepper. Thankfully, Comedy Central announced he will be taking over their 11:30 p.m. slot Monday through Thursday. That show, whose format and title have not been finalized, will premiere in the fall. In the meantime, a new hour long special focused on the gun control debate will help Klepper maintain a high profile. Jordan Klepper Solves Guns is a fantastic piece of comedy and investigative journalism. It’s essentially an extended version of a Daily Show field piece, and your attention is held all the way through. The special highlights legal obstacles and personal stories around the issue of gun violence. Sen. Cory Booker (D-NJ), former ATF special agent David Chipman and former NRA lobbyist Richard Feldman are among those featured. 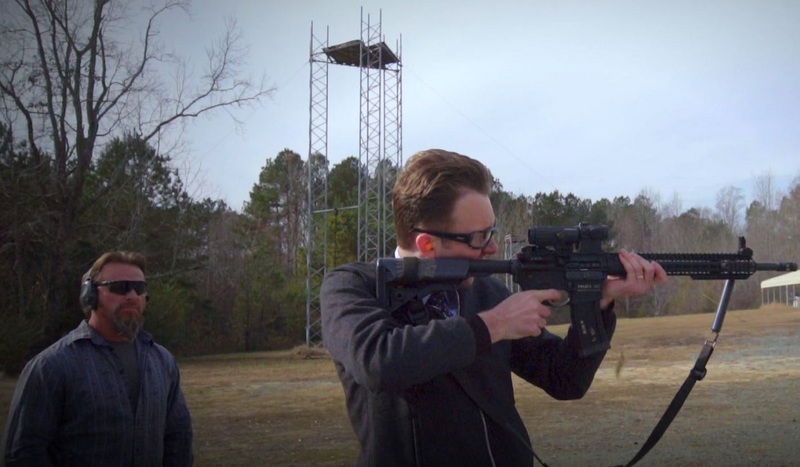 Klepper embeds with the Georgia Security Force militia and trains with former Army Special Ops soldier Pat McNamara. In his hometown of Kalamazoo, MI, he interviews Midwestern moderate gun owners, including his own cousin, Pete. This special isn’t just about America’s toxic relationship with guns—it’s about how needlessly alienating the debate around that issue has become. The hour begins with the stereotypical liberal viewpoint; all guns are bad! But Klepper’s character quickly realizes that the vast majority of Americans support stricter background checks. So why do we seem so divided? The answer is simple: NRA lobbyists. All of this is explained through humorous segments that form a cohesive story of sorts. For extra footage, fans can watch an extended version through the Comedy Central app. Obviously, Jordan Klepper Solves Guns won’t solve America’s firearm problem, but it’s a fun and enlightening way to spend an hour. Let’s hope Klepper brings his signature sarcasm to 11:30. I give Jordan Klepper Solves Guns an A-.